Situated in the heart of Delhi's (NCR), this Noida hotel features easy access to the top attractions in this international business hub. Featuring warm hospitality, modern décor and commodious services, the Radisson Blu hotel's Noida location will make you feel at home in lavish surroundings. Rest well in spacious hotel rooms and suites, impeccably furnished and perfect for relaxing after a busy day of meetings or sightseeing. Enjoy a delectable meal at the on-site R.E.D., or rejuvenate with a refreshing swim in the large pool. An in-house spa and extensive meeting facilities round out the list of convenient features of the Radisson Blu hotel's Noida location. To top it off, the hotel's food and safety management system is ISO 22000 (9000 and HACCP) certified. 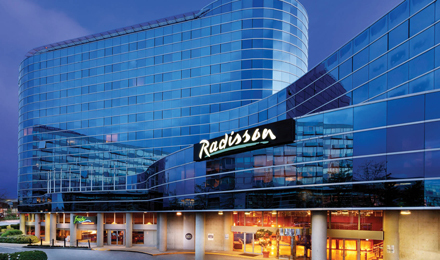 The Radisson Blu hotel's rooms and suites in Noida all feature desirable amenities like free wireless Internet access, a flat-screen television and your choice of newspaper. Nestled in among the intricate suburbs of India's largest metropolis, the hotel's 127 rooms in Noida are a relaxing oasis in the heart of the NCR. Choose from Deluxe, Business Class, Crescent and Privé Rooms, or opt for an Executive Suite or the lavish Presidential Suite. Home to two fine dining restaurants, a lounge and a continental bistro, the Radisson Blu Hotel Noida offers a wide array of traditional and international cuisine. Sample savoury Asian specialities at the award-winning R.E.D., or enjoy a modern take on Indian classics at Made in India. S-18 is open 24/7 and is ideal for an informal meeting or quick meal. 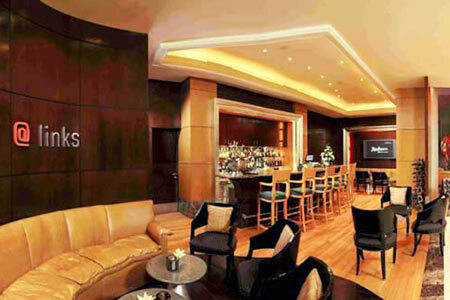 During your trip to the Radisson Blu Hotel Noida, be sure to complement your delicious meal with a drink at @Links lounge.